I’ve been meaning to review this for the last few years, always planning on posting about it during Black History Month in February, and every year, I get distracted and forget. 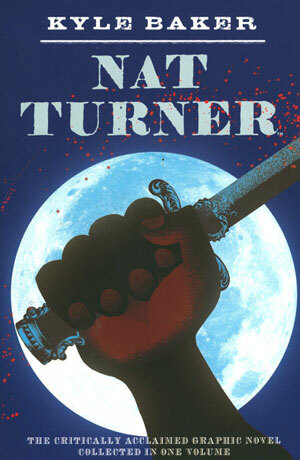 Not this year — here’s Kyle Baker’s amazing graphic novel biography of Nat Turner, the leader of the bloodiest slave rebellion in the United States. Turner was a slave living in Virginia. He’d taught himself to read, because it was illegal to teach slaves to read — slaveowners didn’t want educated slaves because they were more likely to rebel. Turner’s interest in reading was mainly so he could study the Bible, and his knowledge and high moral character had many fellow slaves referring to him as a prophet — he also had periodic visions which he believed came to him from God. And one of his visions, combined with a few convenient solar eclipses, eventually convinced him that God wanted him to lead a battle against the forces of evil. And in the American South of the 1830s, evil was definitely well-represented among white slaveowners. When Turner and his accomplices began their rebellion, they initially stuck with quiet weapons — knives, axes, farming implements — rather than guns, and they didn’t just kill slaveowners — they killed women and children, too. They spared poor whites who they felt were as downtrodden as slaves, but they still ended up killing 60 people and amassing a force of 70 slaves and free blacks. Turner himself is believed to have killed only one person — he was extremely smart, but he was a lousy fighter. The rebellion was put down after two days, but Turner was able to hide out for several months. When he was finally captured, he was tried and sentenced to be hanged. He was also beheaded, and his body was buried in an unmarked grave. Kyle Baker’s book takes most of its text from Thomas Ruffin Gray’s book, “The Confessions of Nat Turner,” which included extensive interviews with Turner during his trial and before his execution. His art illustrates passages from the book, or interprets common episodes in the lives of slaves. There is very little dialogue or word balloons, and the art is entirely black, white, and sepia-toned brown. It’s a stark and brutal story, frequently very violent. Turner and his rebels massacre families, ambush people in their homes, behead children — their actions shock us, and I think, rightfully so. But it’s still very hard not to sympathize — Turner’s actions aren’t sugarcoated, but it’s also made very clear that he’s living in a terribly unjust world, where slaves were subjected to horrible punishments for crimes like reading and playing drums. Slaveowners were said to be terrified of slave rebellions — and a lot of that terror may have been because they knew they deserved whatever the slaves would do to them. If you only know Baker’s work from his wonderful “Plastic Man” series from a few years ago, this story will probably knock you out of your socks. His cartoonish style on DC’s comedic series is nowhere to be seen here. The art is, at turns, rough-hewn and furious, and then lushly rendered and gloriously lit, sometimes crudely emotional, sometimes shockingly beautiful, and sometimes both at once. It’s a fantastic story about an unsung American freedom fighter, beautifully illustrated by one of our great graphic storytellers. You bet you should go pick it up. I couldn’t agree with this more. Kyle Baker is one of my favorite comic creators of any era, and “Nat Turner” shows his artistry at full-strength. It’s also an important, tragic part of American history that is overlooked way too often. I know I never heard of Nat Turner in school. Did you read Baker’s “Special Forces”? That is some of the finest, most biting satire of the U.S. fondness for war in the Middle East I’ve ever seen, and it does it by highlighting how much we take advantage of the people we get to fight those wars for us.